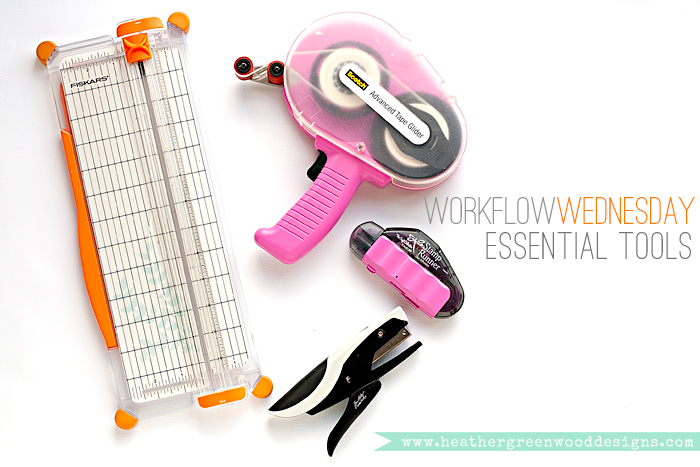 This month and throughout this workflow series, I've been sharing many of my favorite tools for pocket scrapbooking. Today I'll be focusing on the most essential tools for my workflow. btw, the Becky Higgins Project Life® Design A Big Pack (60 pages) page protectors are only $8.95 on Amazon, so I grabbed some more and took advantage of the awesome deal! Today, I'll be sharing my favorite trimmer, adhesives and attacher and why I love them so much and think they are absolute MUST-HAVES for every paper crafter and scrapbooker, not just pocket scrapbooking. Fiskars SureCut Paper Trimmer: I LOVE LOVE LOVE the wire guide so you can line up and see exactly where you are cutting. It makes cutting out the hybrid journal cards soooo easy and I've never had a problem with it! Scotch ATG Advanced Tape Glider: This thing is THE BEST!!! I've tried sooo many tape runners and they all gum up or have issues or the adhesive isn't sticky enough (especially for paper projects, not really an issue for pocket scrapbooking). The adhesive in these hold super strong and it glides so nicely! I just adore it to pieces! A definitely must have for any paper crafter! It's HUGE as you can see, LOL! Tombow Dot Adhesive Stamp Runner: This is my fave for intricate objects like wood veneer and intricate die cuts. Instead of a line of tape, it's tiny little dots which stick to the element and isn't sticking out like line tape does. I really love the shape of this one too. I haven't had any problems with gumming or getting stuck like I've had with other dot adhesive runners I've tried. Tim Holtz Idea-ology Tiny Attacher: I just LOVE this thing, it goes everywhere with me and the tiny little staples are so cute! My most favorite stapler! Isn't it adorable?! I love everything about it. I love the size and the grip and I've never had any problems with it! It's another MUST-HAVE for any paper crafter!